Editor’s note: this column was originally published on Capital Essence’s CEM News. It’s being republished as a bonus for the loyal readers. For more information about subscribing to CEM News, please click here. Good Morning, this is Capital Essence’s Market Outlook (the technical analysis of financial markets) for Tuesday October 23, 2018. We’ve noted in the previous Market Outlook that: “the fact that the S&P is basing sideways near key support as it worked off the short-term oversold condition rather than bouncing higher, indicating an internal weakness.” As anticipated, S&P closed lower Monday as worries about a deluge of corporate earnings reports coming this week and rising geopolitical tensions also dampened investor sentiment. For the day, the bench mark gauge fell 0.4 percent to 2,755.88. The Dow Jones Industrial Average dropped 0.50 percent to 25,317.41. The Nasdaq Composite, however, gained 0.3 percent to close at 7,468.36. The CBOE Volatility Index (VIX), widely considered the best gauge of fear in the market, fell less that 1 percent close at 19.89. Worries that higher mortgage rates would cap loan growth sent banks stocks lower Monday. Bank of America and Citigroup both fell more than 3 percent. After surging 20 percent in 2017, the Financial Select Sector SPDR ETF (XLF) tumbled 2.14 percent on the day and is down 6.5 percent YTD. Now the question is whether recent pullback is a pause that refreshes or it’s a beginning of something worse? Below is an update look at a trade in XLF. The graphics below are from our “U.S. Market Trading Map”, show the near-term technical bias and trading ranges. As shown, the underlying is in a short-term bullish trend when the price bars are painted in green. The underlying is in a short-term bearish trend when the price bars are painted in red. The yellow bars identify period of neutral or sideways trading pattern. Additionally, the light-blue shading represents the short-term trading range. A move above or below that range is considered overbought (as represents by the red shading) or oversold (as represents by the dark-green shading). Readings above or below the red and green shaded areas are considered extremely overbought or extremely oversold. Our “U.S. Market Trading Map” painted XLF bars in red (sell) – see area ‘A’ in the chart. The first dominant feature on the chart is the rising trend line starting in early 2016. The second dominant feature of the chart is the downward trend since early 2018. The early October selloff pushed the ETF below the 1-year moving average, a key technical level, last week, and down to the 2-year moving average. This level has been tested several times as support and resistance over the past years. A close below that level on a weekly basis has measured move, just below 23, or the 4-year moving average. Short-term technical outlook shifted to slightly bearish. Last changed October 22, 2018 from bearish (see area ‘A’ in the chart). The big picture is the same. 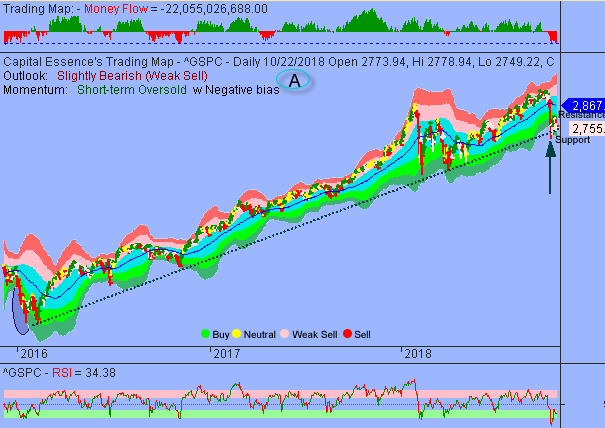 S&P continues basing sideways using the 2016 rising trend line as support after the oversold relief rally attempt ran out of steam near the important sentiment 2800 mark. Near-term technical backdrops are deteriorating, and monetary conditions are deteriorating. Right now the most important to watch is the retreat and rebound behaviors as the 2700 level is tested as support. If we start coming under 2700, it’ll break the multi-year uptrend. That would imply a lower low, which would imply more supply than we’ve seen in these other pullbacks. If the market is going to find a bottom in the near term, we want to see the S&P closes back over 2800. Short-term trading range: 2700 to 2826. S&P has support near 2767. A close below that level has measured move to 2700. The index has resistance near 2826. A close above that level has measured move to 2867. Long-term trading range: 2580 to 2300. S&P has support near 2747. A close below that level has measured move to 2580. The index has resistance near 2840. A close above that level on a monthly basis has measured move to 3000. In summary, S&P could signal an extended downward trajectory, depending on how it closes over the next few days. Technical backdrops and monetary conditions are deteriorating, suggesting the index might have to go to a much lower level to attract new buyers. 2700 is the line in the sand. It held in the first down move that started earlier this month. A close below that level indicates a change in sentiment and increases the probability of a full blow correction. © All rights reserved and actively enforced. Note: This is a free edition of The Market Outlook, a daily CEM News subscriber newsletter. 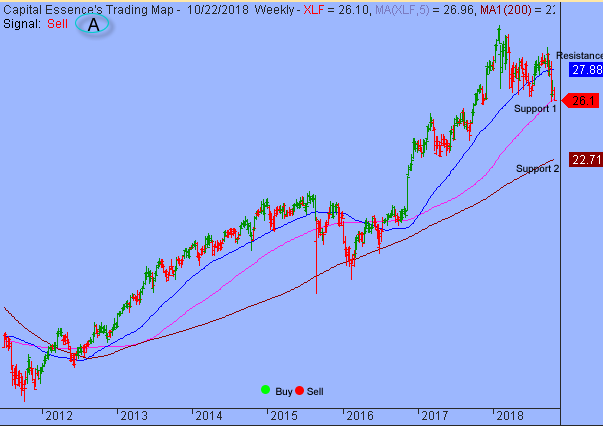 To get this column before market opens together with hundreds of technical trading ideas (including stocks and ETFs) every month, please click here. Subscribe to CEM News to receive more in-depth research from Capital Essence.